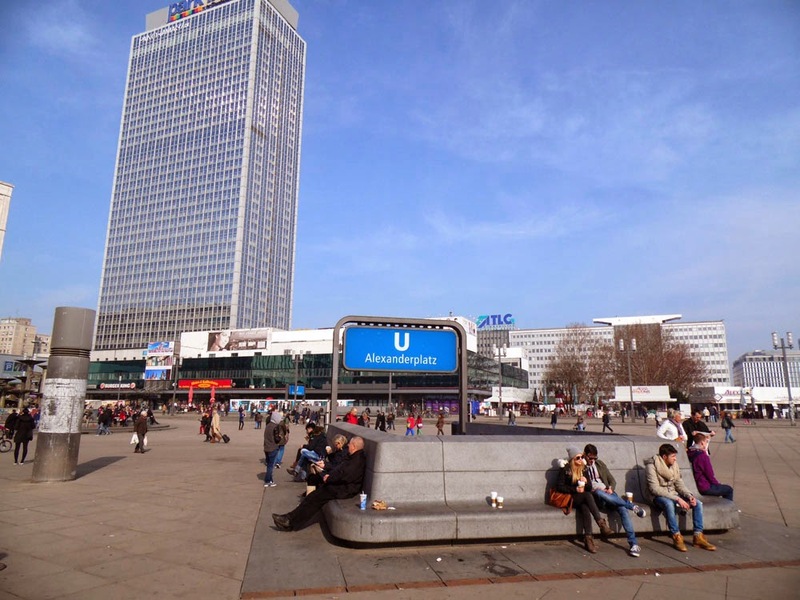 Alexanderplatz is the much developed commercial centre of Berlin Mitte. 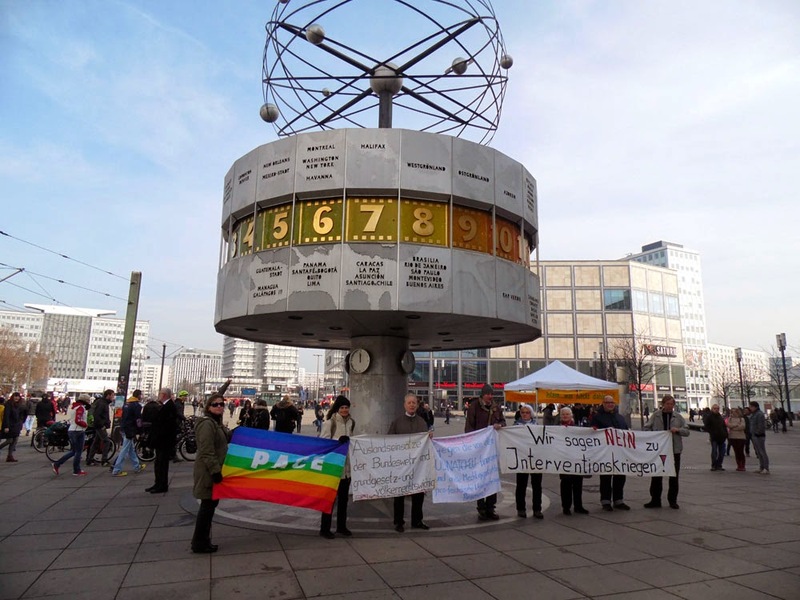 It has greatly changed in the times between each of our visits to Berlin and during our time living here, and continues to transition from the former East Berlin epicentre of cultural and political life to a West German imitation of Manhattan, USA. 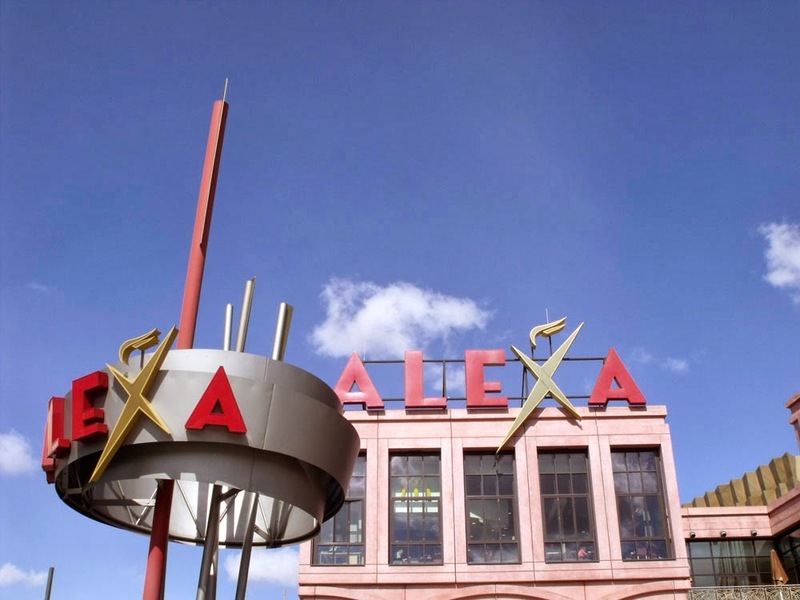 Relics of the DDR such as the Fernsehturm, the World Clock, the horrible Park Inn, and the scruffy Brunnen der Völkerfreundschaft sit incongruously side-by-side with the Galeria Kaufhaus department store, the Saturn store, and the rosy-hued Alexa shopping centre. I don't know if I preferred it more when there were second-hand clothes and bookstalls under the railway arches rather than fast-food outlets, or whether I quite like all the high-rise modern architecture sprouting up around the otherwise drab plaza bringing fresh blood into the heart of the city. 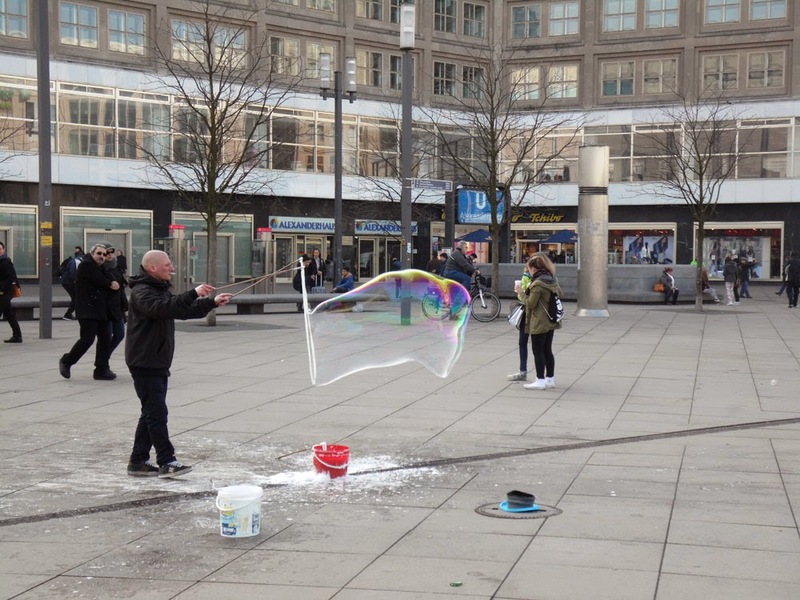 Either way, I feel Alex captures the essence of Berlin, and when I go there I still feel the rush of realisation when I first visited: 'wow! 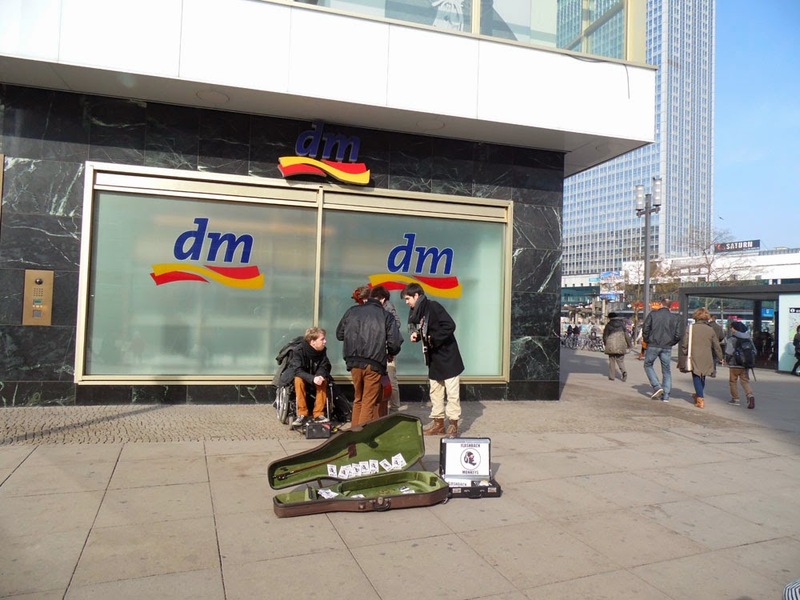 We are on Alexanderplatz!'. Here are some photos that I hope will express the variety of impressions around this unique spot. 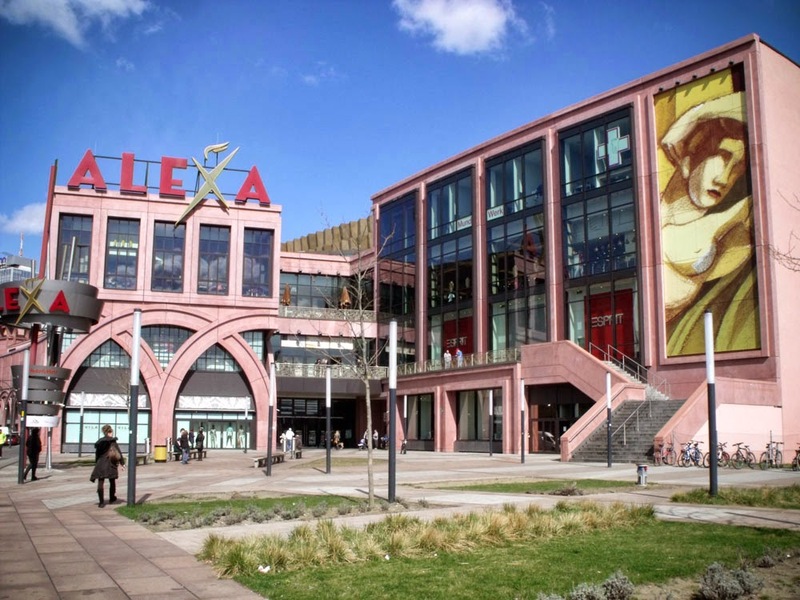 Definitely not a cookie-cutter mall, its architecture mirrors the arches of the elevated railway line, the colours of the nearby Rotes Rathaus, and a golden-twenties 'Metropolis' feel from its heyday as a focus for risqué entertainment and shopping. 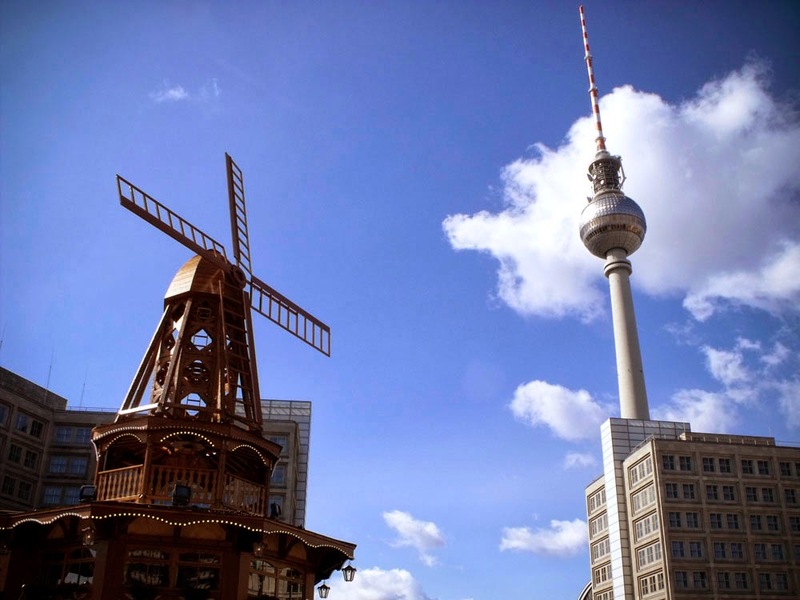 The Fernsehturm towers over the distinctively retro Alexanderplatz Bahnhof, with a ubiquitous Grillrunner selling sausages from a mobile barbeque. 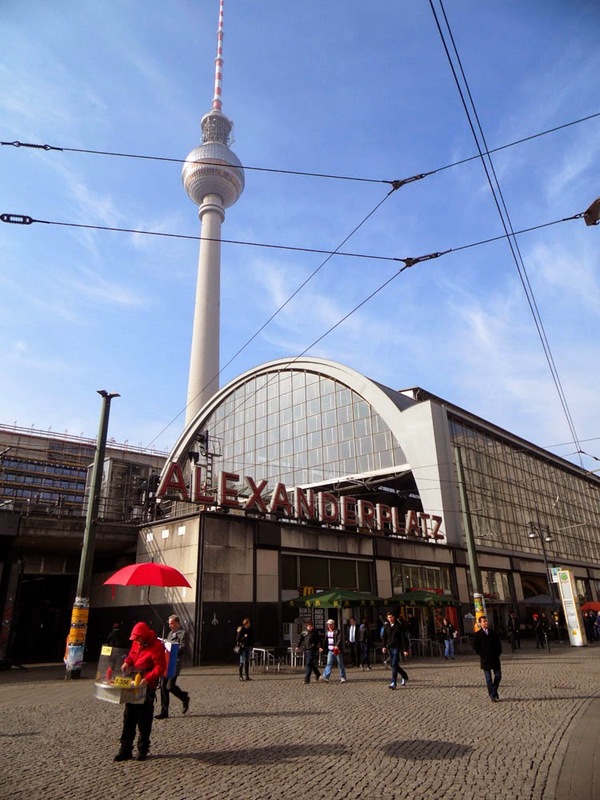 The famous Flaggenhaus am Alex. 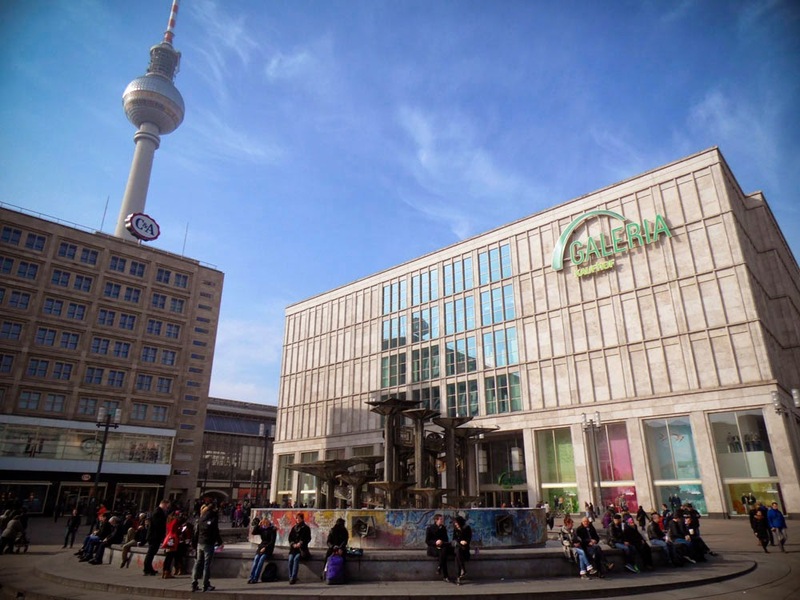 Yes, it is a store that just sells flags of the world, and seems to have been there forever. 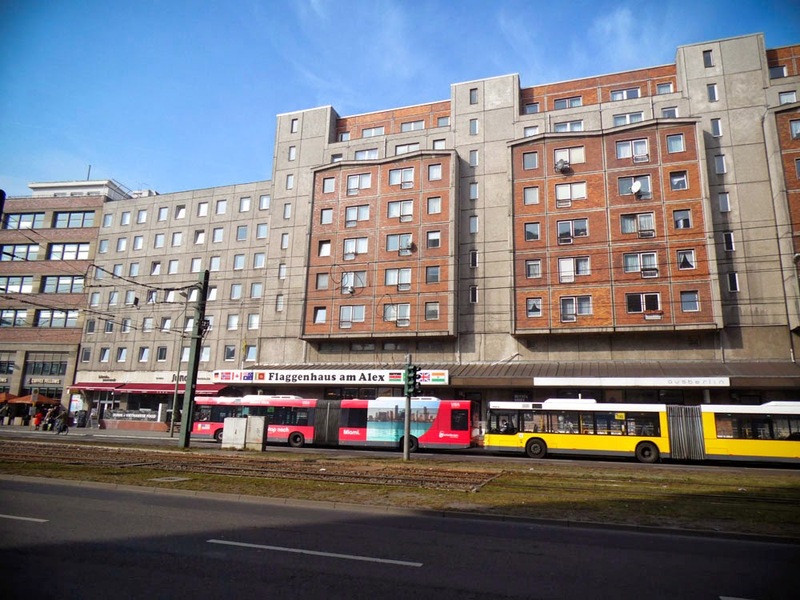 How much longer this store and Plattenbau apartment block will remain is in doubt. 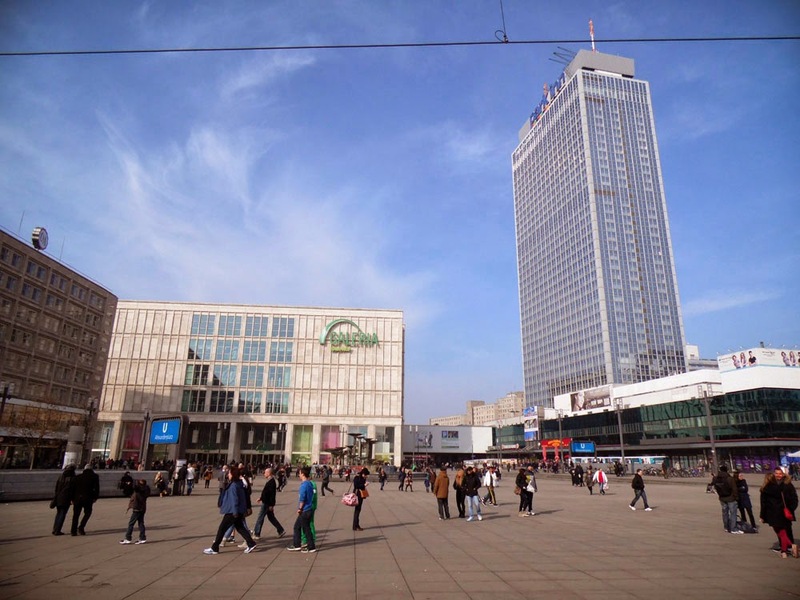 The former Haus des Berliner Verlages. 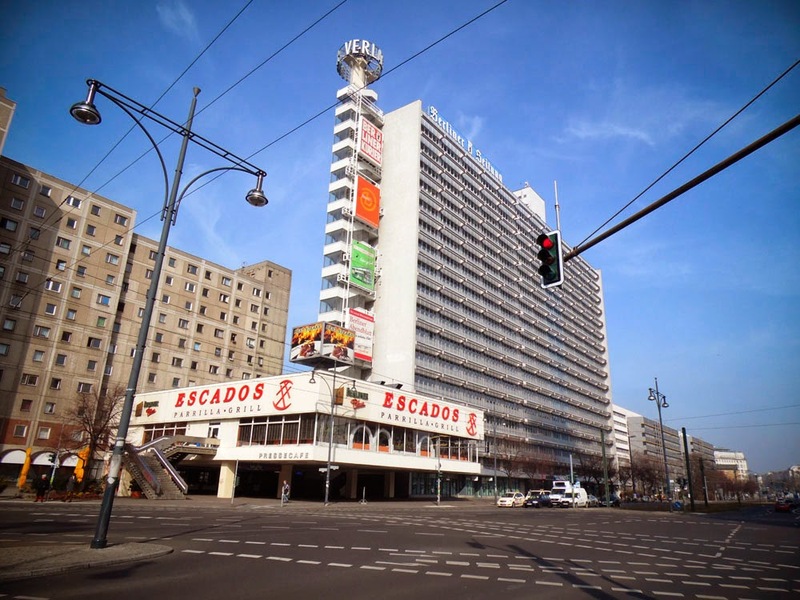 The Eascados restaurant used to be in DDR times the prestigous Presse Café and used to sport a social realism mural, now gone. 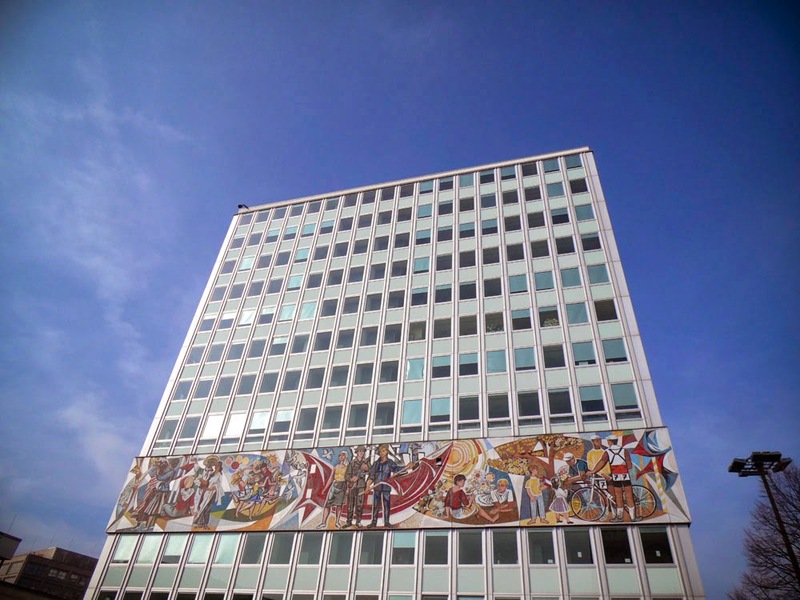 The Haus des Lehrers, which thankfully still retains its social realism mural. 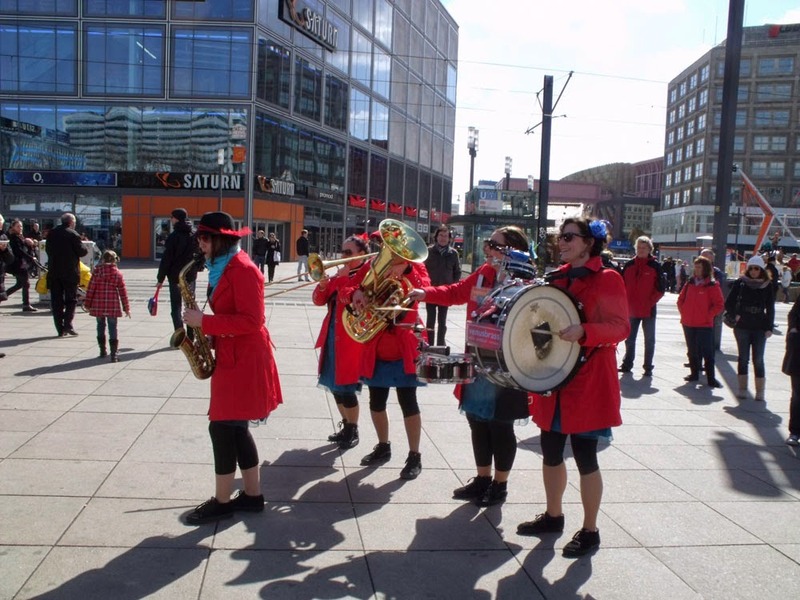 More colourful buskers liven up the Alexanderplatz experience.